Ann Lubin Buttenwieser ’57 was recently honored by the Metropolitan Waterfront Alliance with the Hero of the Harbor award for her work on the “Floating Pool Lady” and the New York City waterfront during the last 30 years. The Floating Pool Lady—a multi–award-winning swimming pool that floats in a barge—was the brainchild of Buttenwieser, an urban planner and waterfront director in several New York City agencies. 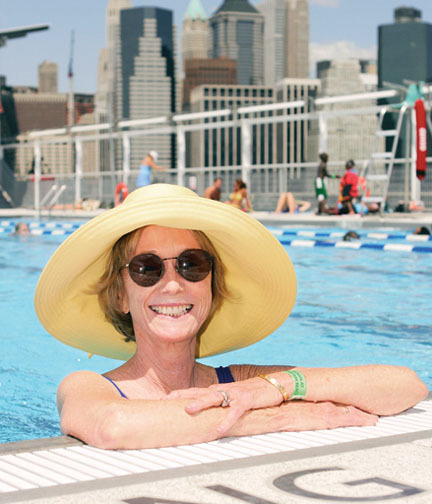 As a result of Buttenwieser’s vision and persistence over more than a quarter century, the pool opened in 2007 at the new Brooklyn Bridge Park and is now stationed in the South Bronx. In 2001, Buttenwieser founded the Neptune Foundation, a nonprofit organization to “commission the design and construction of a new generation of moveable pools for the waterfronts of recreationally underserved communities.” With the help of renowned architect Jonathan Kirschenfeld and naval architect Kent Merrill of C.R. Cushing & Co., the former, 80-foot-by-260-foot cargo barge was transformed into a self-sustaining, seven-lane, 25-meter-long, public floating swimming facility. Buttenwieser describes herself as a waterfront open-space fanatic and says that she would like to see a flotilla of floating pools in New York’s rivers.